Great Streets | Park View, D.C.
New Crosswalks Added to Intersection of Georgia & New Hampshire Aves. Area residents may have noticed that the intersection of Georgia and New Hampshire/Rock Creek Church Road became a little more attractive over the weekend. 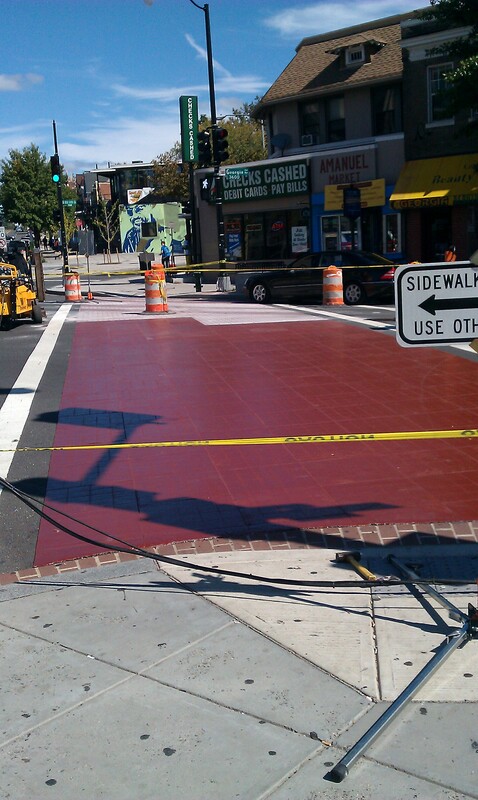 For a good amount of time on Saturday a crew was enhancing the crosswalks with a faux brick appearance. For me, it was kind of interesting to watch. I have to admit, I am completely ignorant of the process and materials that were being used — though I know I can call DDOT and find out quickly enough should it come to that. But, from watching the process it appeared that brick colored sheets were placed over the existing asphalt, then the brick imprint and top coat were added to make the crosswalk look like actual brick. While I know that many may think that this is purely aesthetic, decorative crosswalks also yield safety benefits. The color, which is typically burnt red, helps to calm traffic by making the crosswalk easily distinguishable from the street pavement and are intended to draw more attention to the crosswalk. For me, I’d just be happy if they helped keep stopped cars out of the crosswalk while pedestrians have the walk light. 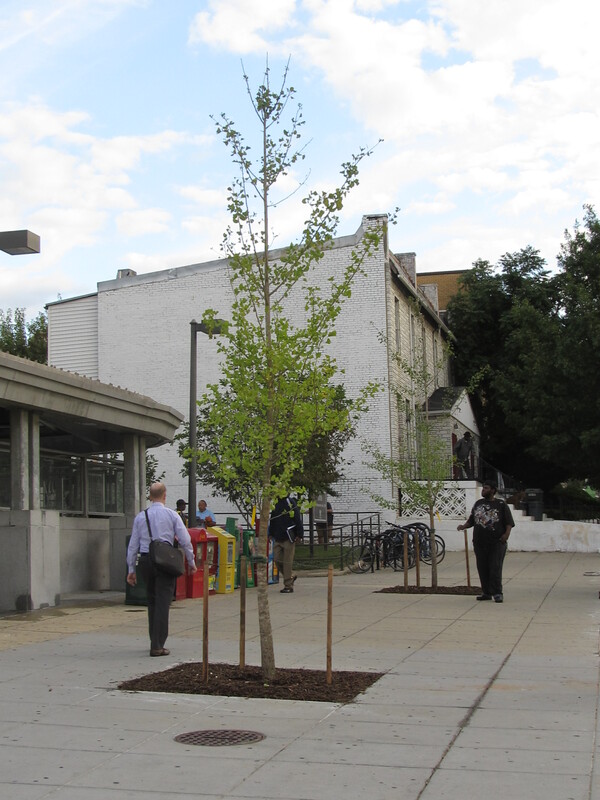 With some area residents coping with power outages or worried about flooding yesterday, I wonder how many noticed the new ginkgo trees planted at the Georgia Avenue Metro station. 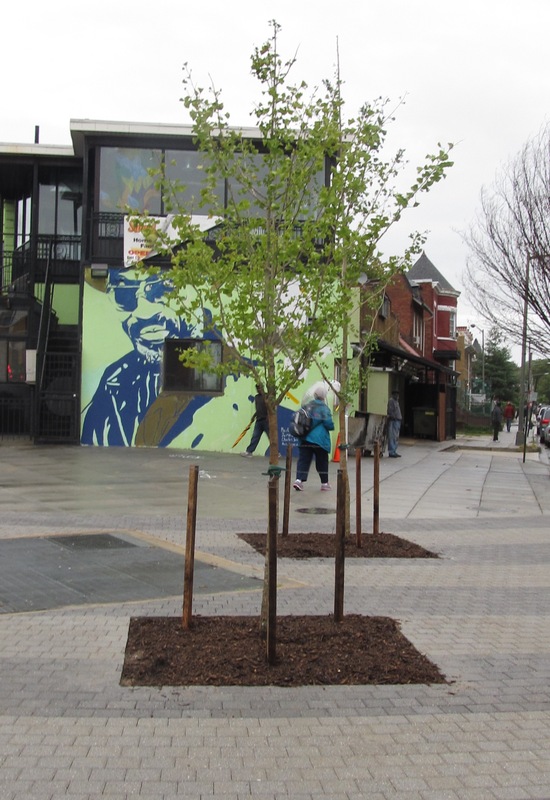 Ginkgos were also planted on the wedge in front of Sweet Mango (between New Hampshire and Rock Creek Church Road). While the trees are about the last components of the Middle Georgia Avenue Great Streets project to be installed, they were a planned part of the project from the beginning. Though I’ll admit that I have a love/hate relationship with ginkgos, I’m thrilled that we have more trees around the Metro station and Sweet Mango. Both sites lacked much needed shade in the summer months. Based on a few comments I’ve received, I know that some in the community would like a better idea of just what streetscape work is going on at the Georgia Avenue Metro station and the wedge in front of Sweet Mango. 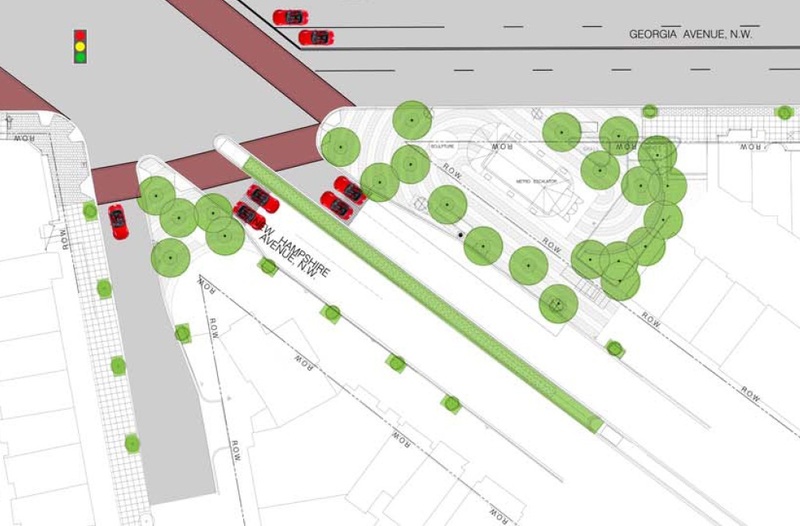 While I posted the working drawing of what DDOT intends to do and alerted folks that the Capital Bikeshare has permanently moved to the northwest corner of the Georgia Avenue/New Hampshire Avenue intersection to make way for additional trees, it is still hard to conceptualize just exactly what the end product will look like. 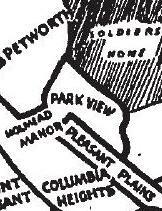 So, to help readers out, I pulled the following images out of the Middle Georgia Avenue/Petworth Presentation that dates to March 10, 2009. I hope that they provide a much better idea of what is in store for our community. 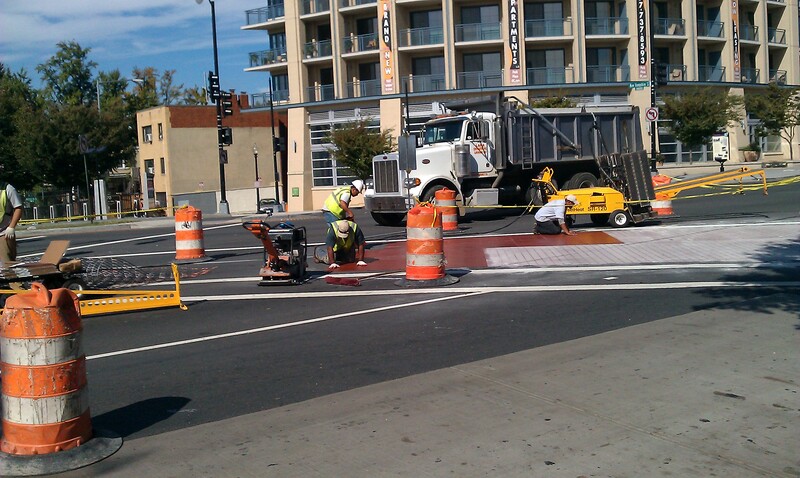 As I posted on Friday, DDOT began their final push to complete the Middle Georgia Avenue Great Streets project on Monday, June 25th. In addition to the bike racks that will be installed in front of DC Reynolds, the major work will be around the east entrance to the Georgia Ave. Metro Station and the wedge in front of Sweet Mango. Not only will DDOT be installing pavers to match what has been installed elsewhere on Georgia Avenue, the area around the Metro will also be getting several more tree boxes. 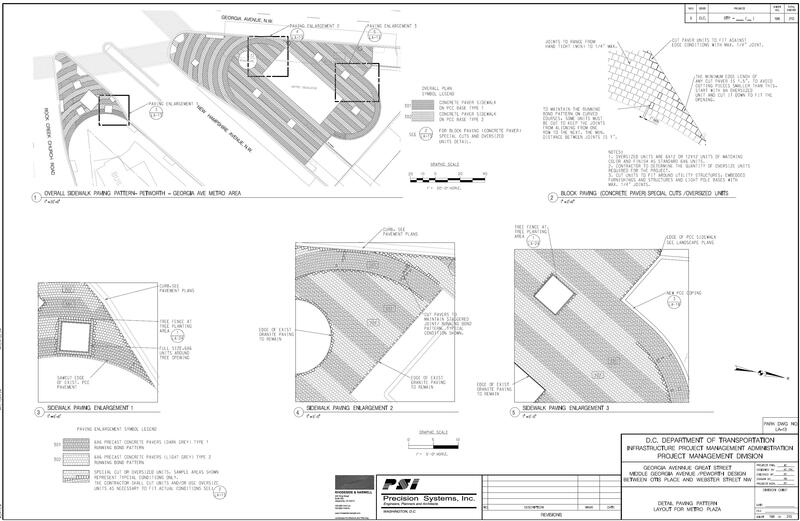 The detail below, from DDOT’s plans, show both the pattern of the pavers and the locations of the new tree boxes. Due to the time of year, there is a very high likelihood that the new trees will not be planted until the regular seasonal tree planting season later this year or early next year. 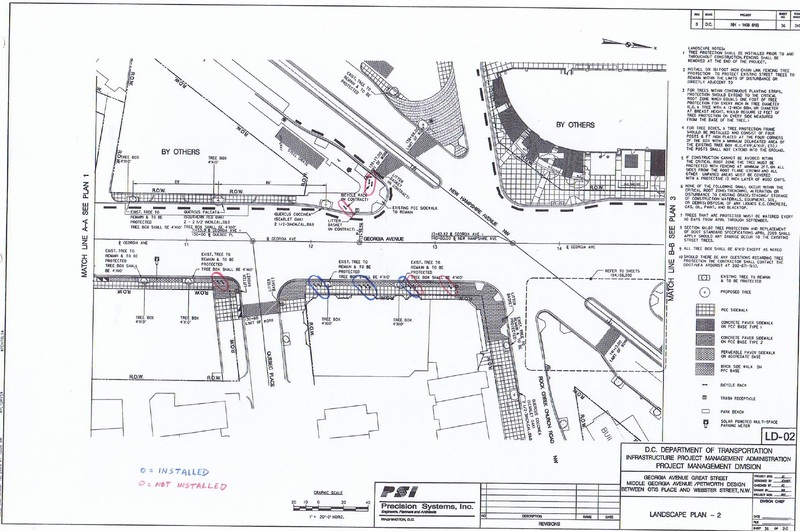 Back in December 2011, as the Middle Georgia Avenue Great Streets project was nearing its end, I met with DDOT to discuss placement of bike racks between Otis Place and Rock Creek Church Road. 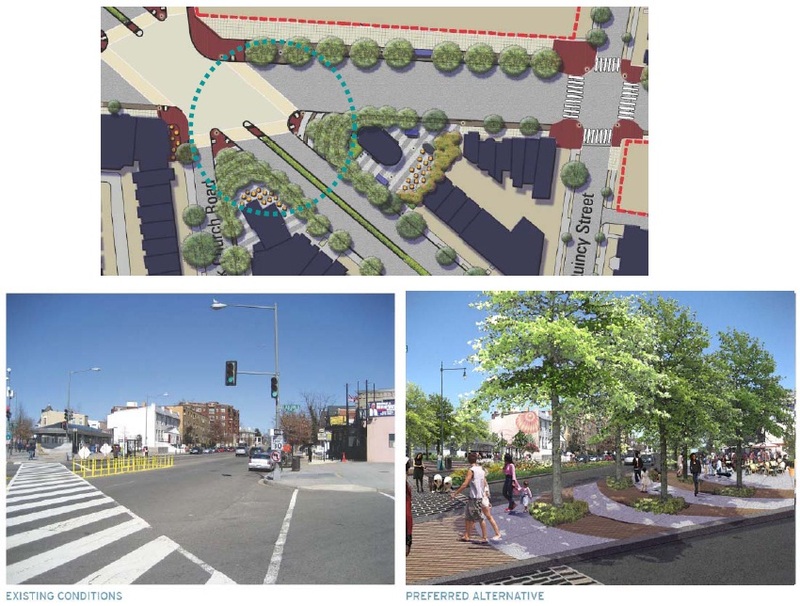 The outcome of that meeting included the agreement that four bike racks would be installed outside of 3628 Georgia Avenue (DC Reynolds) in addition to the four racks outside of the Looking Glass Lounge/Blue Banana. Anyone that has been along this stretch of Georgia recently will clearly see that the additional racks have not yet been installed. 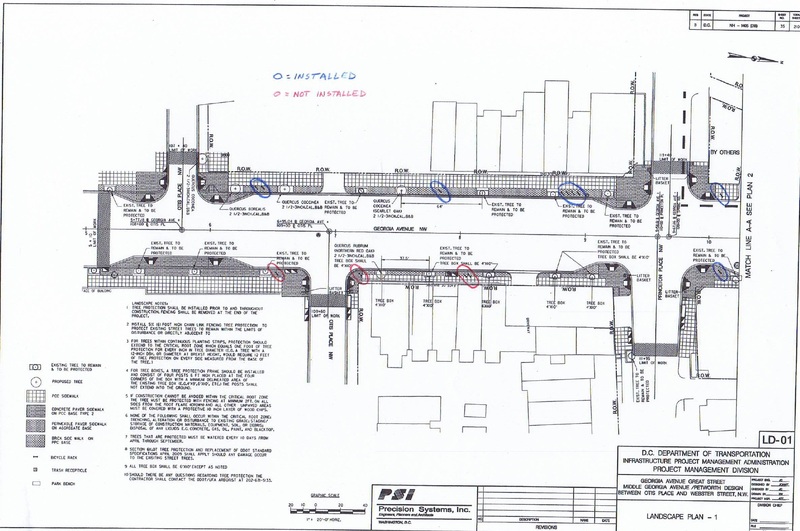 In following up with DDOT in April I learned that there had been a minor plan/contract error which resulted (among other things) in fewer bike racks fabricated for the Middle Georgia Avenue project than were shown on the plans. 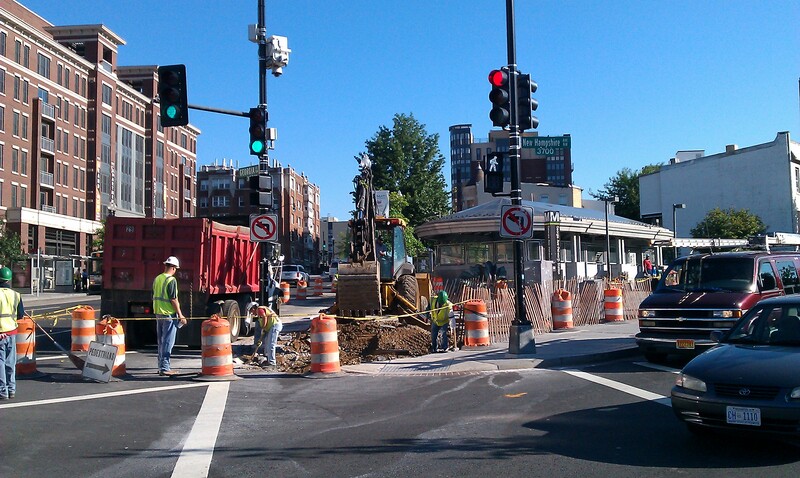 By May, DDOT was moving forward with processing the change order for the remaining project work at the Georgia Ave.-Petworth Metro Plaza. I’m happy to report that everything is now in place for work to resume again as early as Monday June 25th on the remaining work . This will include, among other items, the bike racks, a trash can outside of Lion’s Fine Wines, and Metro Plaza work. More Bike Racks Coming to Georgia Avenue — Where Are They Needed? As I reported at the start of the week, quite a number of new bike racks were installed last week on the section of Georgia Avenue between New Hampshire Avenue and Otis Place. In following up with DDOT and the Great Streets team, I’ve learned that more bike racks are coming as well as trash cans and benches. 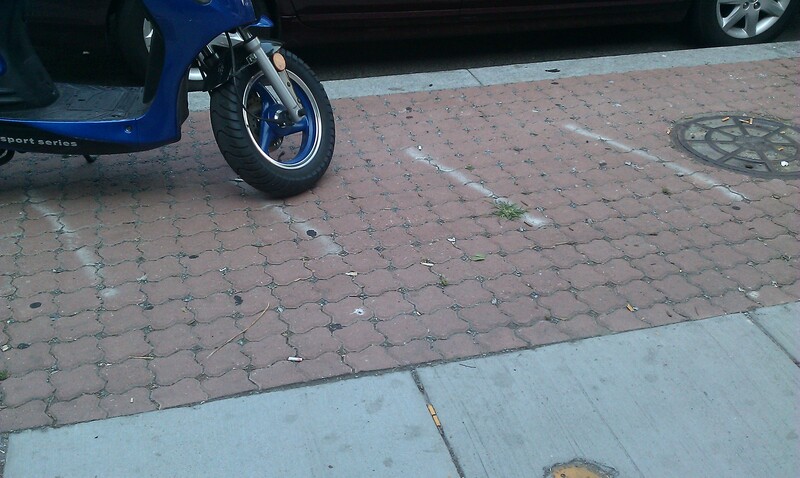 I believe that we can also get some of the current bike racks moved if they need to be. Below are the maps for Georgia Avenue showing the area between New Hampshire Avenue and Otis Place, NW. Bike racks circled in blue have already been installed, those circled in red are yet to be installed. I’m posting them here to better learn where residents and business owners would like to see them installed. 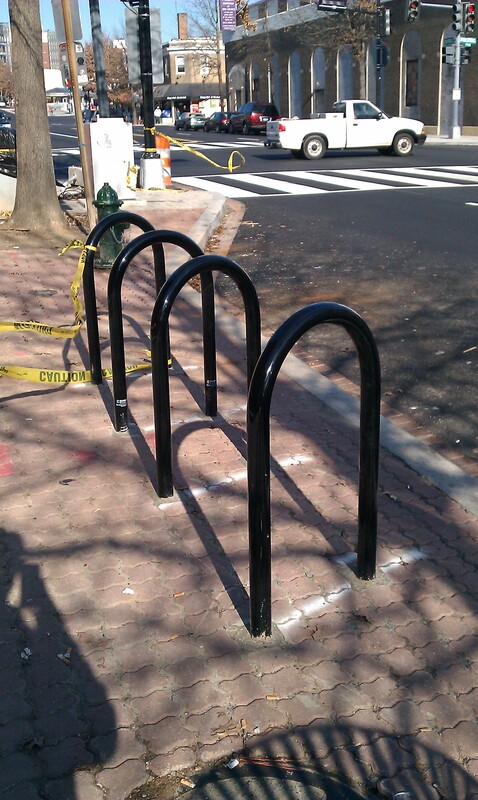 The section of Georgia Avenue north of Otis Place received several new bike racks at the end of last week. 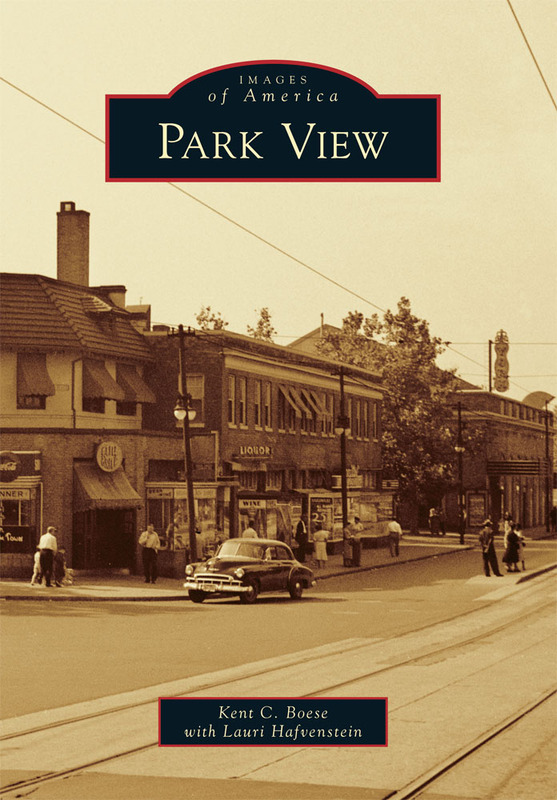 There were several outside of the Looking Glass, a few outside of the Fishermen of Men Church, and a slew on the block between King’s Deli and Ace Check Cashing. All of these racks are part of the Middle Georgia Avenue Great Streets improvements. While I’m grateful that we finally have much needed bike racks on this stretch, especially in the area around Looking Glass, Blue Banana, and the future DC Reynolds … I’m a bit disappointed that all that was installed are the basic black racks. 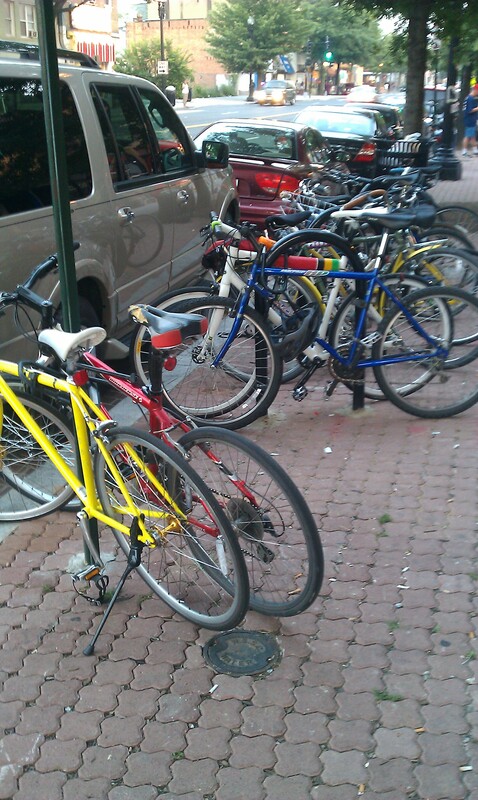 To me, while the basic racks are ok, they aren’t great — and this was a “Great Streets” project. I would have preferred something more artistic and special for Georgia Avenue. 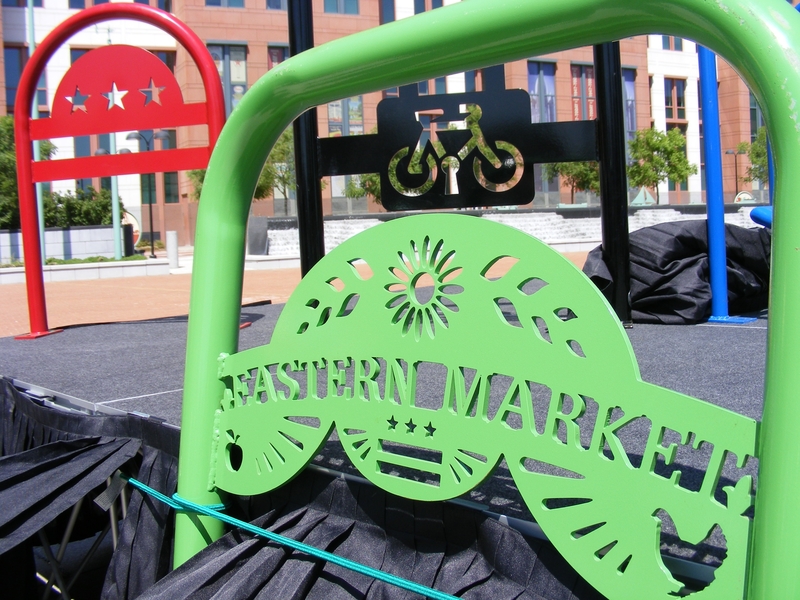 I don’t think that would have been too much to expect since DDOT has worked with local artists to develop special bike racks for other parts of the city including Eastern Market, Chinatown, and other locations around the city. To me, Georgia Avenue deserves no less.